It’s hard to believe that this fall marks 12 years since “Superman (It’s Not Easy)” became a huge song for Five For Fighting in the aftermath of the 9/11 attacks. Coincidentally, today marks September 11, 2013, and the 48-year-old singer and songwriter is now just days away from releasing a new studio album entitled Bookmarks. 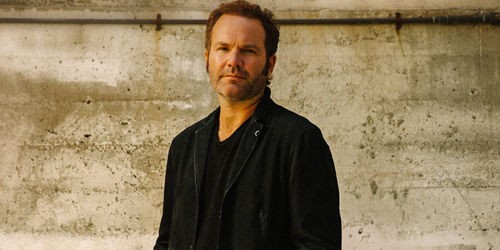 The last decade has had its up and downs for John Ondrasik, from breakout star to faltering album sales and eventually a change in record label. Nowadays, it isn’t so much about the success as it is about being inspired and making good music. So, with that, I guess it’s safe to say that he’s at least accomplished that goal when it comes to his new material, at least for the most part. Bookmarks starts off a strong note with the anthemic “Stand Up”. It’s pretty adaptable for the next feel-good reality show or miniseries, although I’m not too wild about the higher-pitch harmonies in the chorus. Still, it’s rocking. A step up from there is “What If”, the current radio single from the album, an introspective song about life from an outsider’s perspective. It recently went to #3 on my personal chart. That one finds its strength lyrically, with a slightly heavier arrangement a la Gavin DeGraw or Train. That’s not a bad thing; it does work for Ondrasik and proves he can evolve with the times. Probably the biggest surprise of the album is third track “Heaven Knows”, and hearing it in the context of the album, I’m surprised that it wasn’t chosen as the lead single. I would love to see it serviced as the followup if there is a second single. It’s almost a religious experience: it’s poppy, he’s got a backing choir, and the good preacher has a sermon about love that he’s carrying to the masses. He sings, “Tell me where the good men go, before I wash away/Walk me down the old brick road so I can die where I met you.” He is certainly in his element and as the most contemporary sounding song on the album, it’s a little more accessible than even “What”. Other standouts include “I Don’t Want Your Love”, which flourishes with strings and is one of the stronger performances vocally. The feel of it seems influenced by Bob Dylan‘s “Make You Feel My Love”; perhaps it serves a response to it. “Road To You” is an energetic love song with a chorus that’s vaguely reminiscent of Rod Stewart‘s “Rhythm Of My Heart”. “You’ll Never Change” is possibly the only song on here that actually references something related to the title: “I know you’ve put down our second chapter/But as an actor, darling, read between the lines.” Snappy, but I like the attitude of it and the confidence that shines in Ondrasik’s voice. There’s also “Your Man”, which takes some cues from Coldplay and Jamie Cullum into a Brit Rock-sounding statement about identity and being faithful to one’s own self. There’s a couple of tracks on here which bring in the cheese factor for a little fun which aren’t the best. One of them is “Down”, whose opening line is a tip of the hat to Hank Williams, but it just falls flat and is a little bit uncomfortable. The other is “She’s My Girl”, which would be alright if not for the cringeworthy, “She’s better than ice cream/I know you know what I mean.” I mean, really? Now, I get it, it’s just a little change of pace, but I shall pass. I’m also pretty torn on “Symphony Lane”. Musically, it’s beautiful, and lyrically, it’s mysterious. The fuller orchestra in that extended instrumental piece is just heavenly. However, in the overall picture of the album, it’s lost on me. It sounds like it was meant to be on a film score. I would’ve saved it for something else, but I think it’ll end up being a fan favorite and excellent live in the right setting. On a more serious note, perhaps the most powerful track is the album’s closer, “The Day I Died”, a stripped down composition with only Ondrasik’s vocals and the light taps of the piano. Though everything is changing around him, he proclaims, “I was alive the day I died.” Now, if the guy was still regularly played on the radio and got his due justice in the national spotlight, I probably wouldn’t have focused so much on this. However, this feels like a genuine goodbye to me. I mean, this is his sixth album and he’s essentially in the twilight of his career, at least when it comes to recording and releasing original music. Maybe he knows it’s time to move on. He’ll still have a presence, in a diminished manner, which he acknowledges in one of the ending lines, “a few people noticed and sang my songs.” It’s just so sad if it’s actually true, but then again, it might just be a character. Still, you can’t help but get a passing the torch kind of vibe from it. It’s really, really well done. 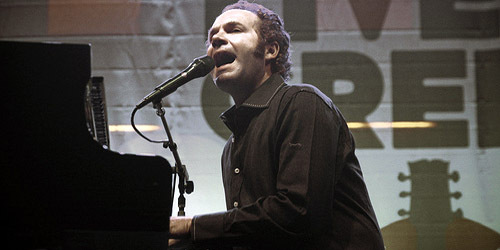 I don’t know what the future holds for Five For Fighting. After this album, it’s likely that the lowered sales and even more limited radio airplay will factor into whether he remains with Aware and Wind-up Records. I’m always going to have a place for Two Lights being my favorite release from Ondrasik, the one that actually made me become a bigger fan of his work, but this isn’t too far behind. Whether this closes the book on this era or begins a new tale in his musical journey, Bookmarks was aptly named for the places we pause in order to take something in: love, life, death, etc. The pages may be marked up, but the story remains the same. Listen to Bookmarks on AmazonMP3. / Pre-order Bookmarks on iTunes.